These delicious little carrot cakes will be a huge hit at your Easter get together this year. 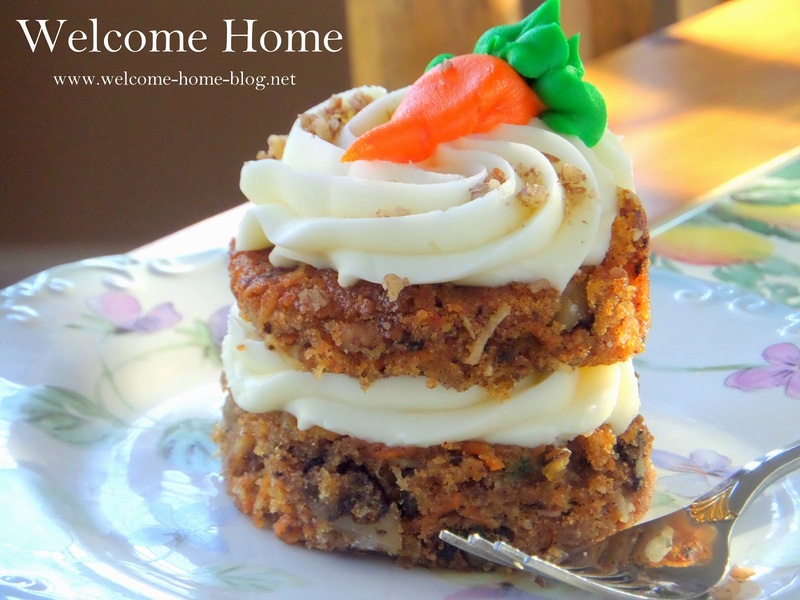 I made them special for the loyal fans of my Welcome Home online blog magazine. They always count on me to bring them something different and special! These are just a hint of what's to come in the next issue of the Welcome Home Online Magazine. It's the Spring issue coming out on April 1st and it is loaded with great recipes for your Easter dinner. But it doesn't stop there. I have include my best spring recipes too. And lots of helpful cooking hints and helpful tips. Remember these recipes are my favorites and have never been seen before. You'll only find them in the online magazine. This is not a print or paper magazine. It's a webpage. The magazine is a big and bright website that flashes up on your screen once you are given the key to unlock it. It is colorful and vibrant and so easy to read on your computer, tablet or cell phone. You can take it with you wherever you go and see it on your phone or tablet or Kindle or Nook. You say you like your magazines in print format? Okay....so print the recipes out and put them in your own binder and you'll have them in print format. Or you can sit back and relax and read it in front of your laptop or desktop computer. You can visit it whenever you want and see all the current and past issues as soon as you buy it. And because it comes out once a month, you'll find yourself eagerly waiting to see what is in each new issue! Are you looking for recipes that are easy to make and absolutely delicious? You'll find them in the magazine. Each month, I post as many as 25-30 brand new, never before seen recipes from my very own collection. Recipes that are quick and easy to make for any meal or occasion. You'll find beautiful photos of each finished dish and in even step by step instructions on how to prepare it. Right now there are over 300 recipes that you will have access to and another 300 or so coming if you subscribe. Do you like kitchen tips and how to's that can save you time and money? I like to share my own with you in the magazine. I bring you ideas and tips that you'll love and they'll make you say, "Why didn't I think of that!" I share other advice too...like answers to questions when you get stuck on making any recipe. Do you like cool kitchen gadgets and tools to make your life in the kitchen easier? Yep, those are there too! I pick the coolest ones I can find and put them in the magazine each month...but only after I personally try them out first! And I find the best price for them so you pay less for whatever you like. And there's a gift shop too! Where you can also find some of the nicest gifts for your friends and family and even yourself when you deserve a treat! Again I shop for the best prices and pass them on to you. We even have gifts for your fur baby too! And each month we add even more gifts for you to choose from. And you get all that for only $2 an issue! I promise you'll instantly see the value when you see all the work that goes into it. This magazine is so well worth the money spent. And there's an added bonus: Once you purchase the magazine, you'll be invited to join an exclusive private Fan Club for subscribers only. There you'll find even more recipes and tips! We have a group of subscribers there now having a great time sharing even more recipes and fun ideas. And now the best part....some of the proceeds from the sale of The Welcome Home Kitchen Magazine will help me save the lives of dogs and cats who are killed unnecessarily while waiting in Kill shelters for someone to come and adopt them. I have been there my friends. I have held them during those last hours before they are led down a long dark hallway to their death. I wanted them to feel loved before their lives were taken. And it broke my heart watching how excited they were as they thought they were being taken to re-unite with their families. People they loved so much and were so worried about when they didn't see them again. But I've have also seen them rescued at the last minute by NO KILL volunteers who take them in and love and care for them until they are adopted by a new forever family. That's why I do this....that's why you should buy this magazine. Some of the proceeds will help me feed the homeless who are about to face another cold winter on the streets. I take them warm food and drinks and warm clothes and blankets to shelter them from the harshness of winter. I have been doing it for years and have lost some that have not made it through to Spring. They count on me. They depend on me and I will never let them down. But I need your help. So consider your purchase of this wonderful magazine a bonus for helping the homeless....two legged and four legged. Look at it as a way to make sure they get food and warmth. To make sure they feel loved and wanted. They say that only a hungry person can understand the true pain of hunger. Those of us who have never been there can't even imagine. But we can help with kindness. And kindness is serene when nothing is expected in return. True kindness comes from a heart that doesn't differentiate between the hunger of an animal or a human. So what are you waiting for? Click on the link and you'll be enjoying it within minutes.